A 60-foot (20-meter) tall Angkor-style monument built in 1958, the Independence Monument was constructed to commemorate the Cambodians winning back their independence from the French in 1953. Renowned Cambodian architect Vann Molyvann designed the monument; the architecture is patterned after a lotus flower and adorned with five levels of Naga heads, which gives it a very distinctive look. Located in the heart of busy Phnom Penh, the Independence Monument attracts many visitors, not only for its unique architecture, but also for its location: it’s in the middle of a busy intersection and the eastern side features a large, open park that is a popular spot for locals to gather and jog or practice tai chi and aerobics. 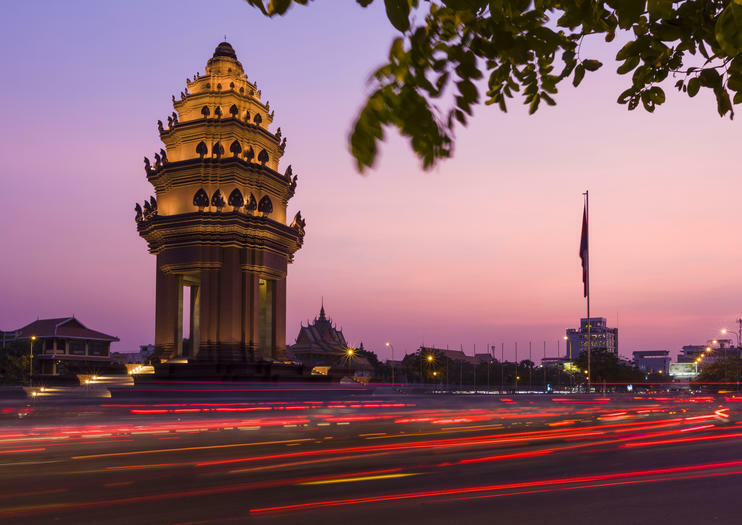 More than just a monument commemorating Cambodia’s independence, it also serves as a memorial to Cambodia’s war casualties and is a symbol of the end of Cambodia’s war. In remembrance, families place large wreaths at the foot of the monument for war veterans. At night, the monument is illuminated by red, blue and white floodlights, the colors of the Cambodian flag. It’s also the site of celebrations and services on holidays such as Independence (January 7) and Constitution Day (September 24). The Independence Monument is located on the corner of Norodom and Sihanouk Boulevards. It’s not really a location to enter, more of one to see; it’s free to the public.